This is old version Swift WiFi 2.8.166 apk for Android, you can install it if you want to downgrade or install old app. It is top Travel & Local apps from DotC United Swift Team. Users will be able to choose their preferred Wi-Fi point from the list. In order to manage the points, users can delete the unused access point. After the device is connected to a certain Wi-Fi access point, it will show information related to the signal strength, link speed, as well as IP address. For your information, as one of connectivity application that you can find on Google Play, it features QR code setup. If you install it in your device, you are allowed to generate QR code out of connected access point. You can scan generated CR code to connect later. It allows you to access your favorite Wi-Fi connection without typing the password. As a free application, it does not include in-app purchases. Most reviewers said that this application is exactly all they need for their smartphone. Swift Wi-Fi for Android allows its user to organize, manage, and connect to nearby Wi-Fi connection swiftly. 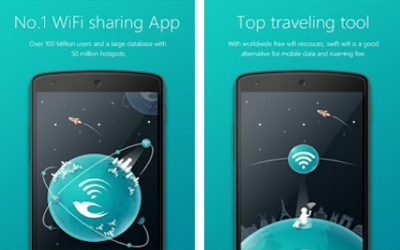 Useful for traveling: Scan for WiFi hotspots and search for free WiFi around you. If no results found, it will get directions that guide you to the nearest WiFi spot. It’s very helpful when you are in a new place. Safety test: Avoid insecure public WiFi or fishing hotspots, protect your online security. Speed test: Accurate network speed test. Smart WiFi: Reduce phone radiation and save battery power. Fast Charge: Kill power draining apps to accelerate charging speed.